Budgeting is one of the main aspects within your control to influence profits and avoid maverick spend. Budgeting and planning help your organization invests resources to best benefit, based on cautious consideration rather than the urgency to make a short-term decision. Budgets are essential to sustain your company’s economic growth and implementing best practices will guarantee a bright future to your company. So how do you implement the best practices for budget management? 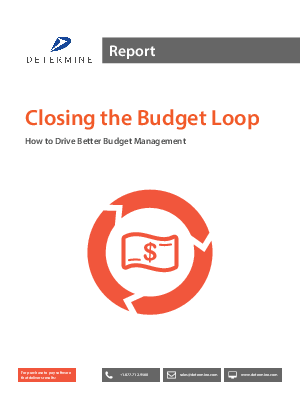 How do you close the loop between budget preparation, execution and forecast? This can be a challenge. William Feather said, “A budget tells us what we can’t afford, but it doesn’t keep us from buying it”. This quote might have been relevant in the past but should not be in our time. To better understand how organizations forecast, plan and execute their budget, Determine created a survey to assess current budget management practices from businesses of all kind. In this report, you will discover the best practices from companies of diverse industries and sizes, leading to better spend management as well as greater control and visibility. This survey covers different topics such as budget structure, execution, planning and budget control.